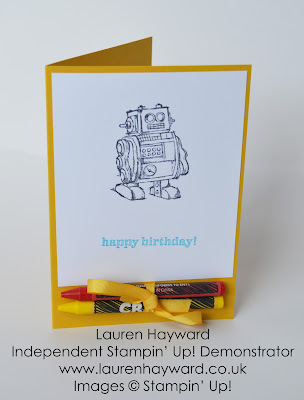 This cute little robot is from the Boys will be Boys stamp set, which is one of my favourites! It is perfect with this design in which I've tied 2 crayons up with ribbon then glued the ribbon to the card. It IS a little unbalanced however by the time the card is put up no doubt the crayons will be gone anyway! I've used Hello Honey cardstock for this one but I intend on making more in a variety of blues! boys will be boys hello honey Stampin Up!